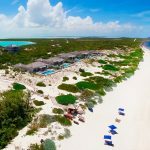 South Caicos offers some of the world’s most crystal clear waters, which makes it an excellent destination for snorkeling. The environmentally protected park at Admiral’s Aquarium features abundant sea life that includes tropical fish, sea turtles, spotted eagle rays and others. The colorful architecture in nearby Cockburn Harbour makes it the perfect place to bring your camera for a walking tour. The harbor is also the island’s only natural, deep water harbor on the island, which makes it a great place to look at visiting boats. Tour guides can provide history lessons on the area, or you can explore on your own and enjoy the sights. Both kayaks and paddle boards are available for guests near the shores of the Caicos Bank. Visitors can spend an exciting afternoon paddling through the tranquil waters and enjoying local wildlife. The area offers frequent sightings of sea turtles, migratory birds, tropical fish and other natural attractions. 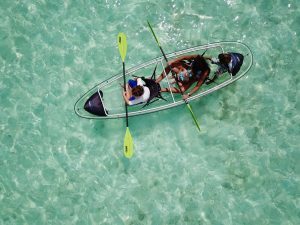 Kayaks and paddleboards are relatively easy to use and after a quick introduction, users will have no trouble gliding across the crystal clear water surrounding South Caicos. The calm water in the area makes it a great place to get your bearings and develop a new skill. The saltpans at South Caicos once made the island the top salt producers in the region. Now, these areas are reserved for a wide variety of tropical birds. Visitors can expect to see large flocks of pink flamingos, giant frigate birds and others. Guided tours are available. You can also take a bird guide book with you to explore the area and spot tropical species on your own. 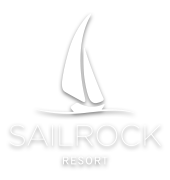 Also known as Sailrock Beach, Long Beach is considered one of the best beaches in Turks and Caicos. Have a lunch packed for you at the resort so you can spend an entire day enjoying the clear turquoise water and sprawling white sand shores. The shallow areas are great for relaxed wading. Some areas of the beach are teeming with activities, including kite-surfing. Others are more natural and tranquil, perfect for a long walk. 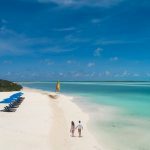 With these and other nearby attractions, you do not have to go far to see the beauty Turks and Caicos can offer. Make a plan to explore what’s nearby for a truly memorable tropical island vacation.